It is a little confusing as to why baby chicks are associated with Easter. 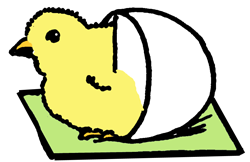 Well here is the reason in a nutshell (or an eggshell) Eggs and Baby chicks are seen as a symbol of new life. And a baby chick hatching out of an egg also symbolized a rebirth ...which is associated with Jesus Christ since he arose from his tomb after he was crucified. Baby ducks and chickens are adorable and sometimes they are given in Easter baskets. However, once they are grown they are given to a farmer to raise. 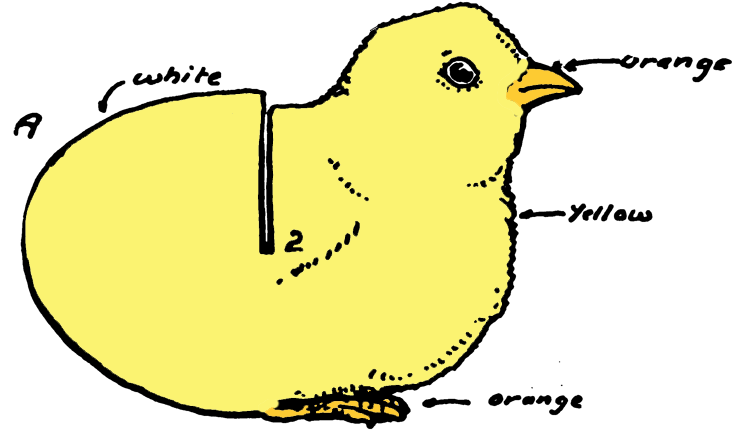 If you are interested in making some Easter Chick crafts, you will find some below. Have fun crafting! This is a craft to make a Baby Chick in an Egg Shell Easter Card. First, Print out the patterns ... pattern 1 in Black and White and pattern 2. Here is Pattern 1 in Color. Now trace around the pattern on heavy white paper or card stock, and cut out. Color with crayons, colored pencils, or water-colors. Cut out a piece of cardboard 3 x 2 inches, and color it green. Now fit figure B down into figure A at right angles to A, so that 1 touches 2. Turn the tabs C under, and glue to the cardboard. This card may be used as a place-card, or folded flat and put in an envelope to send as an Easter greeting. Baby Chickens and Ducks (called chicks) are easy to draw. If you know how to draw circles, then you will know how to draw cartoon baby chicks. 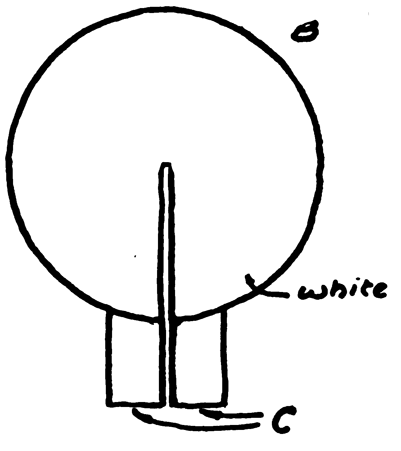 You can draw around a button or coin to make perfect circles (if you want to)...and youc an even cut these circles out and paste them on pages of paper. Or you can just draw them. Either way...drwa circles like a number '8' . The top circle is smaller and the bottom circle is bigger. You can draw a letter 'u' shape for the wing. A circle for the eye and an upside down 'T' and 'L' for legs. 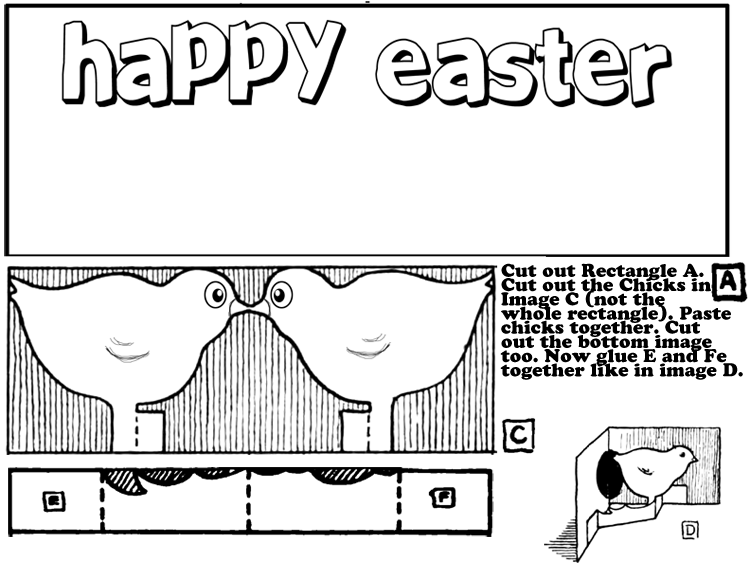 Draw a triangle for the beak. Nothing says Easter like baby chicken or duck chicks. They are so cute, fuzzy, and warm to hold. 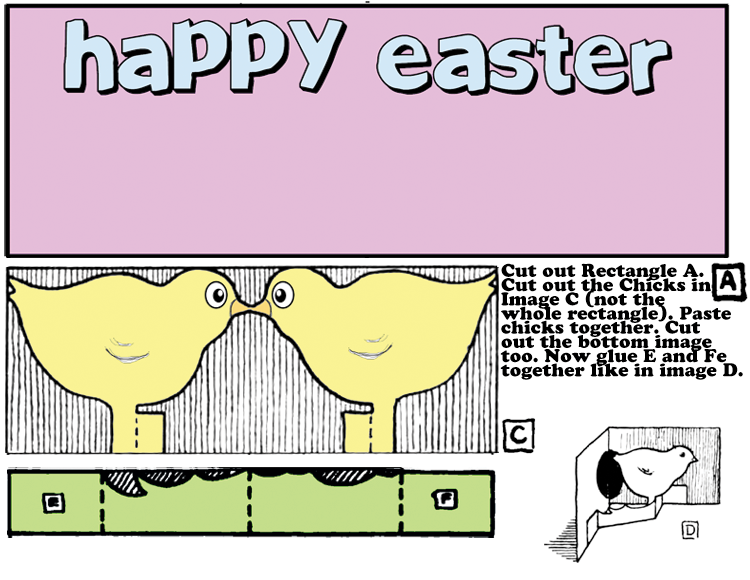 Make this adorable pop-up Easter Chicks Card by printing out the following template and cutting and pasting it together. Herea re the links to print them in black and white or print them in color ... the black and white ones are for those children who want to paint or color them in with watercolors, colored pencils, crayons, or Markers. Making a Pop-Out of the Card Duck - Learn how to make this Pop-Up Cartoon Duck that is sitting on her nest filled with colorful Easter eggs. The part that pops up out of the page is the duck's bill. You can then draw the surrounding duck body and face and it looks like the duck is popping his head out of the page. Cute. 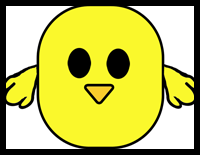 If you want to make a baby chick mask, then print out the following paper chick mask template and follow the directions on that page. 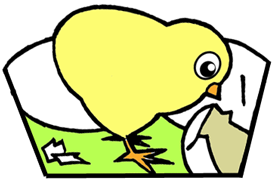 Click on one of the thumbnail images above to learn how to draw cartoon baby chicks. Easter Bunny and Baby Chick See-Saw Paper Toy Card Craft - This is an adorable, working see-saw with the Easter bunny on one side and a baby Easter chick on the other. The see-saw goes up and down with the use of a simple fastening clip. 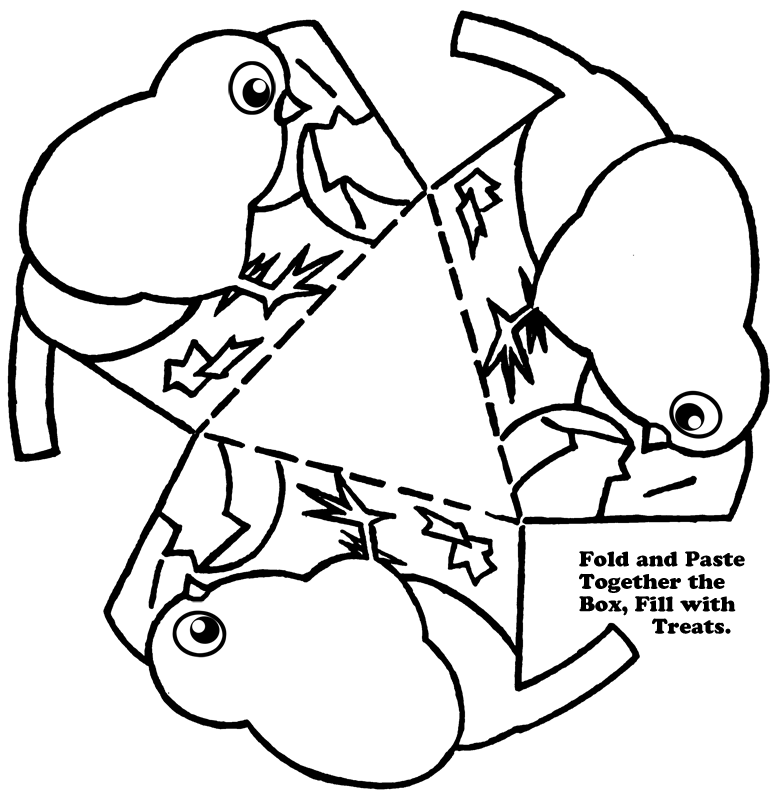 All you have to do is print, cut out, and then fasten the 2 parts together. Easter Animal Standups - Print, cut, and color these Easter bunnies and chicks and fold them so that they stand up. Egg Head Baby Chick Faces - Learn how to make blown egg, decorated animal faces. In this set of directions includes a baby chick to make for Easter. 1st Class Easter Chick Craft - Make a cute and simple Easter Chick from sheets of paper, paper eggs and glue. Baby Chick Arts & Crafts Ideas - Find out how to make the cutest baby chick Easter decoration. Baby Food Jar Animals Crafts Idea for Kids - Turn an empty baby food jars into animals such as chicks, rabbits, dogs and cats. Chicken Mask for Kids to Make for Easter - Here is a fun and easy chicken mask children can make for Easter or even Halloween. Chick Hatching Egg Carton Craft Activity for Children - All you need to make this amazing looking Easter chick are two cotton balls, an egg carton cup, orange construction paper, small wiggly eyes, glue, a Ziploc bag, and yellow food color drops. Chick in an Egg Craft - Find out how to make this fun chick in an egg shell. 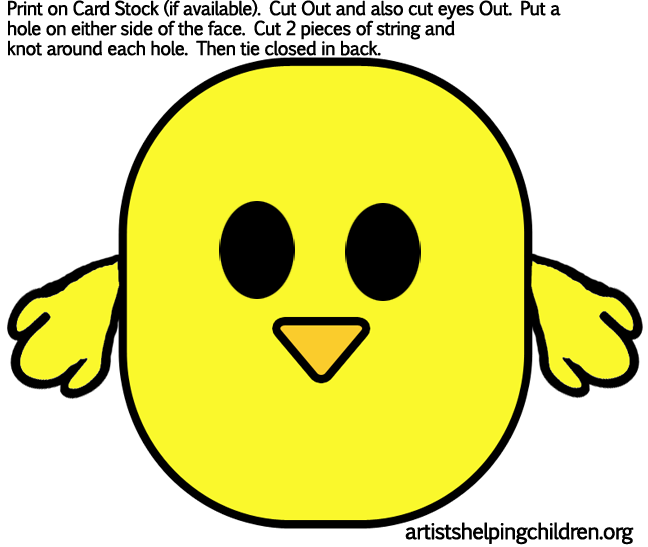 Chick Mask Arts & Crafts Activity - Make a chick mask from a paper plate, yellow paint, orange card, glue and elastic thread. Chick Paper Mobile Craft - Decorate your bedroom with this cute Chick and egg mobile. Chick Pencil Topper Crafts Activity - Find out how to make a simple Chick topper for your pencil or pen. Chick Pencil Topper Crafts Idea - This is a perfect Easter craft for children to make at school or at home. Chicks in a Basket Activity for KIds - Learn how to make this beautiful Easter decoration by following these instructions. Chick Toilet Paper Roll Craft Easter Activity for Kids - This is a simple Easter craft for kids that will teach them the fun way of recycling. Chick Visor Easter or Spring Arts and Crafts Ideas for Children - Turn a yellow visor into a chick hat by using a few inexpensive craft supplies. Chick Yarn Bug Crafts Idea - Why not make a few of these adorable yarn bugs for your family and friends for Easter? Clay Pot Chick Craft - Find out how to turn a clay pot into an Easter Chick decoration. Devilled Easter Egg Chicks Craft for Kids - Learn how to make devilled Easter chicks from hard boiled eggs. Easter Chick Bag Craft - Find out how you can make an Easter Chick from a paper lunch bag. 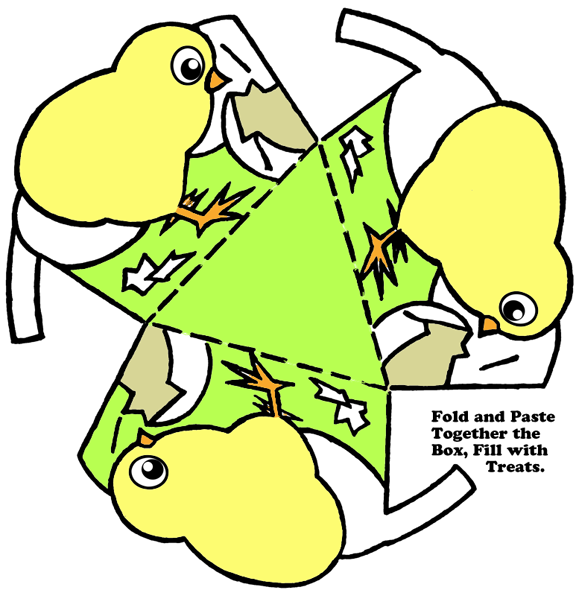 Easter Chick Card Craft for Kids - Make this Easter Chick greeting card for your mommy and daddy. Easter Chick Sticks Craft Idea for Kids - Turn your ice cream sticks, popsicle sticks and craft sticks into Easter Chick sticks. Easter Chick Thumbprints Activity for Kids - Use your thumbprints and yellow paint to make adorable chicks. Easter Critters Napkin Rings Craft Activity - Make these Easter Critters Napkin Rings for your Easter brunch or dinner. Easter Marzipan Animals Craft for Kids - Make cute Easter animals using only white marzipan and foot coloring. Easter Jelly Bean Chick Crafts Activity for Kids - This chick would make a great Easter treat for a special friend. Easter Maracas Arts & Crafts Ideas - Celebrate Easter will these special edition Maracas. Easter Plant Pals Arts & Crafts Activity - Find out how to make these Easter plant pals for your mom’s garden. Edible Bird's Nest Crafts Activity for Kids - Learn how to make this yummy Easter craft by following these simple instructions. Egg Carton Ducklings Activity for Kids - This is a fun Easter activity for the whole family. Egg Carton Easter Chicks in a Basket - Learn how to make Chicks in an Easter Basket from a egg carton cup and other materials. 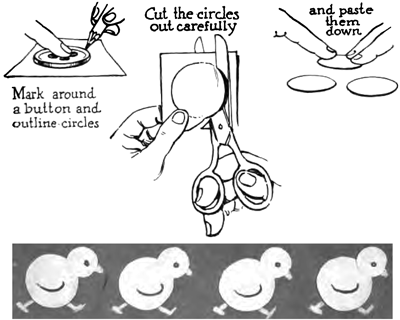 Egg Critter Duck Craft - Follow these instructions to create an Easter duck pal. Eggshell Mosaic Picture Art - Use your imagination to create Easter themed mosaic art from colored Easter egg shells. Fingerprint Chicks Craft for Children - Use your own fingerprints to create an Easter chick. Footprint/Barefoot Chicks Easter Craft for Kids - Use your own footprints to create an Easter chick. Fuzzy Chicks Easter Craft - These Fuzzy Chicks are fun to make. All you need are Styrofoam balls, wiggle eyes, pipe cleaners, tacky clue and pastel wire-free chenille. Handprint Chick Paper Craft for Kids on Easter - Use your handprints to create this unique Easter Chick! Handprint Chicks Easter Craft - Make Easter Chicks from paper, black pen, your hand prints and paint in orange and yellow. Happy Easter Chick Crafts Activity for Kids - A great way to tell your love ones Happy Easter! Hatching Pompom Easter Chick Activity Idea for Children - This Easter Chick will surely brighten anyone’s day. Jelly Bean Chick Craft Activity - These adorable chicks would make great Easter gifts for all your friends. Nest of Hungry Chicks Easter Spring Craft - Find out how children can make this nest of very hungry chicks. Nest o' Fluffy Chicks Easter Craft - Decorate your home this Easter with these cute fluffy chicks. Paper Loop Chick Easter Craft - Learn how to make a chick from yellow construction paper, scissots, glue, yellow feathers, orange pipe cleaners, and markers. Polystyrene Egg Chick Arts & Crafts Easter Activity for Kids - Follow these instructions to create an Easter chick from a large polystyrene egg, yellow paint, orange craft foam, googly eyes, yellow feathers and glue. Pom Pom Easter Chick Craft for Children - A cute and easy Easter craft for preschoolers and toddlers. Quick and Easy Easter Crafts for Kids - Here are a few simple Easter crafts for children of all ages. Rocking Chick Easter Craft for Kids - Make a unique rocking baby chick from a paper plate and a few other supplies. Skinny Chicks and Bunnies Crafts - Find out how you can turn jumbo craft sticks into skinny Easter chicks and bunnies. Sleeping Chicks Easter Crafts Activity - This is a fun way to reuse those plastic eggs! Spring Chick Surprise Craft - A creative way to send a surprise Easter gifts to friends. String Easter Egg and Baby Chicks Craft for Kids - Follow these instructions carefully to make a string Easter egg decoration. Spring Peeps Easter Crafts Activity for Kids - Wish your friends Happy Easter with the cutest card ever! Sunny Pom-Pom Easter Chick Craft - This is the instructions for making an adorable Easter chick from pom-pom.